Yuki Yuna is a Hero is a 12 episode magical girl anime from the creators of Oda Nobuna, Lance N’ Masques, Koukaku no Pandora, and Saki Achiga-hen . It starts off with 4 middle school girls who are chosen to become actual heroes, which is funny because they are all members of their school’s Hero Club. The Hero Club provides community service to other clubs and to their community through volunteer work; to pick up trash, putting on puppet shows for neighboring elementary schools, etc. The entire group dynamic works very well, each girl really compliments each other as a team even before their powers. 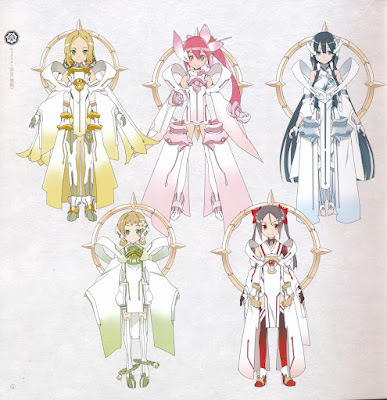 Each of the girls have very fitting personalities; Fuu is a very brash, open, and broad imagination, Mimori is a bit more confident in her abilities but not as outgoing, Yuna is the more willing hero always willing to help no matter what, Itsuki is the more shy and quiet one of the group but always optimistic. While Fu is always the loud one, that is stopped when she gets a mysterious text about aptitude assessment tests. The next day during class Yuna is caught by her teacher day dreaming and forced to continue doing a reading, but as she starts the read everything and everyone around them freezes with only her, Mimori, Itsuki, and Fu being able to move freely. 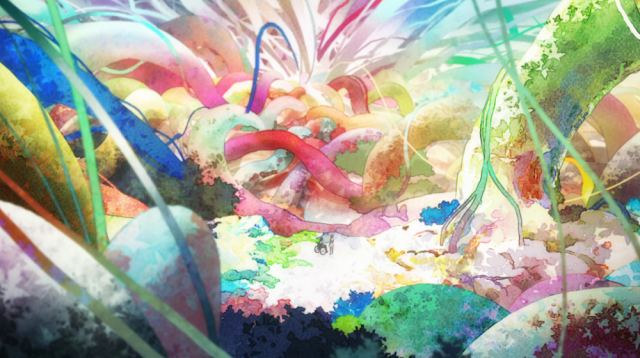 The weirdest thing to come is when a tear in space floods the area in a rainbow soup and the girls are transported to another dimension. The day that Fu had hope would never come has now arrived and she explains to the girls that they have been charged with protecting the world, she gives them a quick lesson in how to transform and quickly goes off into battle. Her sister Itsuki follows with no question, but Yuna and Mimori are hesitant at first. 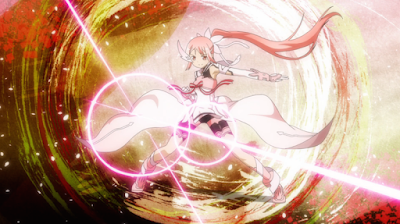 But seeing Fuu and Itsuki fight and almost die protecting them is enough to force Yuuna to transform. What was cool about this scene was the fact that Yuna was able to transform transform without the use of the app. Which made her look like the most badass character for that one episode. Unfortunately Mimori is still frightened by this experience and chooses not to transform in the first episode, but by the second episode she finds her resolve and finally transforms in order to protect her best friend Yuna; Transforming herself into a badass sniper. Each of the girl’s transformations is unique to them in style, color and weapon. 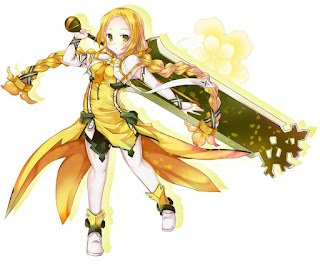 Yuna’s outfit is more dedicated to a brawler and is pink, Fuu has a yellow outfit and wields a huge sword that can grow as big as she chooses, Itsuki has a green outfit with a bracelet of flower bells that can shoot bombs or use vines to ensnare enemies, and Mimori’s outfit is blue and has tentacles that allow her to move freely without the use of her legs and uses a sniper rifle. 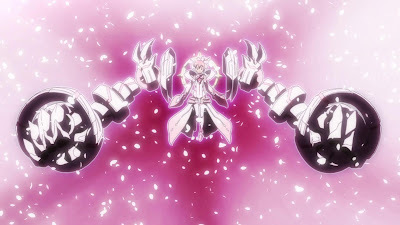 With each enemy the girls defeat they are able to charge their flower symbol and go into a Mankai form (Bankai if you need a reference for what that means). What you will find weird at first is that this Mankai transformation comes a lot sooner than expected in this anime and once you start going through each episode you start to see that things are about to get real. Fuu explains what's going on, that the Taisha Group grants hero candidates the power to fight against the twelve Vertex that threaten Shinju and that battles they fight in that dimension have real world impact. Meaning the longer the fight the worst things can get in the world like earthquakes or simple car accidents. There is also a time limit on how long they can use their powers before they transform back into normal girls and are powerless to stop the enemy. While finally getting light shed on the matter it still causes Togo to become outraged because she felt lied to. It is a quick scene that makes you feel more sympathetic to her character especially since she is someone who has struggled with her disability and now has to go into a battle that she did not choose. But it's Yuna's positivity that brings them back together. It’s in their 5th battle against the enemy known as the Vertexes that they are introduced to another hero and newest member of their team Karin Miyoshi. Because what magical girl group would be complete without at least 5 members. She was sent by their superiors to supervise them, but at first you think she's there to replace them all considering how good she is killing the Vertexes single handedly. As she spends time with them you start to feel that maybe they sent her there more so she could know what it’s like to be part of team, have friends, etc. And of course they start to tear down the walls Karin built around herself turning her into more a of tsundere character than just a random throwaway character. But as the story progresses you see the true nature of gathering all the girls together. Now mind you by this episode they have already defeated 5 of the Vertex with only 7 left. As an anime fan you’re probably thinking oh there’s some big boss that’s going to reveal themselves and reveal their whole plot to take over the world. And if you’re thinking that then you are sadly mistaken. Episode 5 ("Overcoming Adversity" "Konnan ni Uchikatsu") we get the huge climatic battle with the remaining Vertexes which is weird since they don’t normally attack in this fashion and usually stick to a time table. This is where we see the original 4 girls use their Mankai forms, a form Karin has yet to achieve despite the fact that she can take down a vertex single handedly. 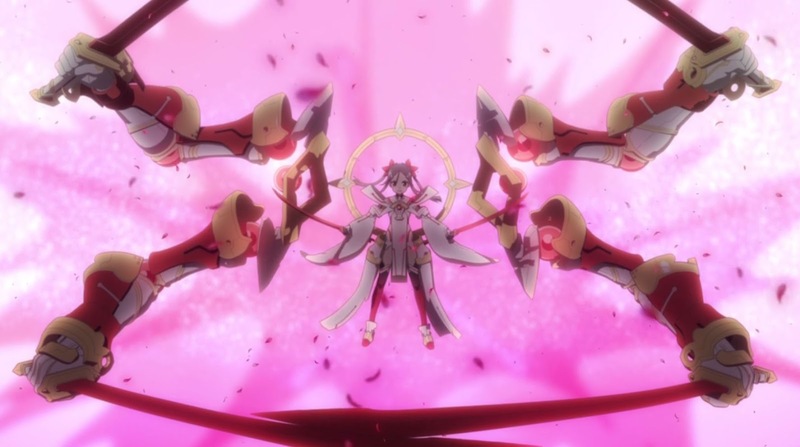 With these Mankai forms the girls become more powerful than they could have imagined and defeat the remaining 7 Vertexes that have merged into one single being. With a battle so intense that it takes place in outer space. It was one of the more intense fights in the series and it delivered a great finish. All the girls are down but not out, they are just happy to have finally defeated their enemy and survived. With the battle done and all 12 Vertex defeated the girls can go back to their normal lives right? Well this is the part where things get dark in the anime. After the battle the girls are taken to a nearby hospital that is run by the Taisha, and after a few tests and some bed rest the girls are sent home. Unfortunately certain injuries did occur after their last battle. Fu lost vision in her left eye and Itsuki lost her voice. As the girls celebrate their victory with junk food galore, Yuna realizes she has lost her sense of taste. Since Karin was unable to achieve Mankai she was without any injury, but while at first Mimori seemed okay she was held for several more days at the hospital. While listening to music she discovers that she had lost hearing in only her left ear. The doctors and the Taisha assure the girls that they are only temporary side effects and they should return to normal any day. But weeks go on with things not improving to the point that it’s affecting Istuki’s school work because part of their curriculum is singing and since she lost her voice she cannot properly participate. Now you would think a school would be able to just transfer her to another music program, but I guess to really show the side effects of the Mankai I guess they needed it to be mandatory story wise. All is not gloom and doom yet, the girls are rewarded during their summer break with an all-expenses paid vacation to the beach complete with private beach house, crazy amounts of food, and of course fan service since it is a beach episode. Once they are back from their break the girls are summoned once more into battle. Each girl, except for Karin, was given a new or an additional sprite to add to their arsenal. It was one last pesky little vertex who at first was an easy kill until it starts overflowing with core souls that almost complete flood the forest, but Yuna with the use of her new fairy partner destroys them all with one super kick. Usually when the girls are have defeated an enemy they end up on the roof of their school, but this time Yuna & Mimori go missing. We find out that they had been transported to another location that looked like it had been ravaged by unnatural forces by a fellow hero Sonoko Nogi. A hero they never knew existed; who it turns out was part of a group of heroes who preceded this current group. She tells she’s been watching them and was waiting for the right time to summon the girls and to tell them the truth of the hero system. At first meeting she calls Togo by another name, Sumi Washio, which at first you think it's due to her injuries. She tells them that when they went Mankai that they sacrificed a part of themselves to the Gods and that every time they go Mankai they will continue to lose a part of themselves until they are no longer able to move on their own like she currently unable to do. And it’s not just body parts but also memories as well. 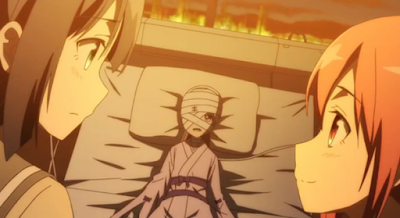 The hero Sonoko Nogi is missing most of her limbs, an eye, and probably other vital organs. She informs them that only young girls are able to become heroes and that they are being sacrificed as an offering, which is why they were pampered so much. She also lets them know that their parents are well aware of this and consider it an honor. With the truth revealed Sonoko hopes it will make the Taisha more honest with the girls about what is going on. When the girls tell Fu however, she tells them to keep it quiet until she can confirm everything with the Taisha. Now fully aware of their situation she realizes the her sister may never speak again and begins to blame herself for dragging everybody into this. 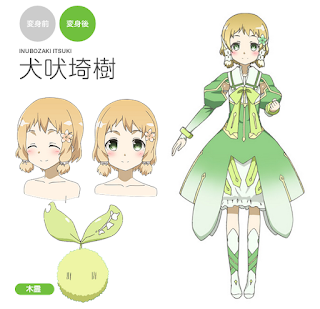 What drives her over the edge and is one of the most heartbreaking scenes in the show is that a few months ago prior to the final fight with the Vertexes, Itsuki who had her shyness with singing had sent out an audition tape to an Pop Idol company. The company calls Fu and informs her that Itsuki had won their Idol search contest and can't wait to meet her. What makes this such a crushing moment is when you hear Itsuki talk about the help she got from her friends and then song Itsuki sings you realize that at such a young age all her dreams may never be fulfilled. 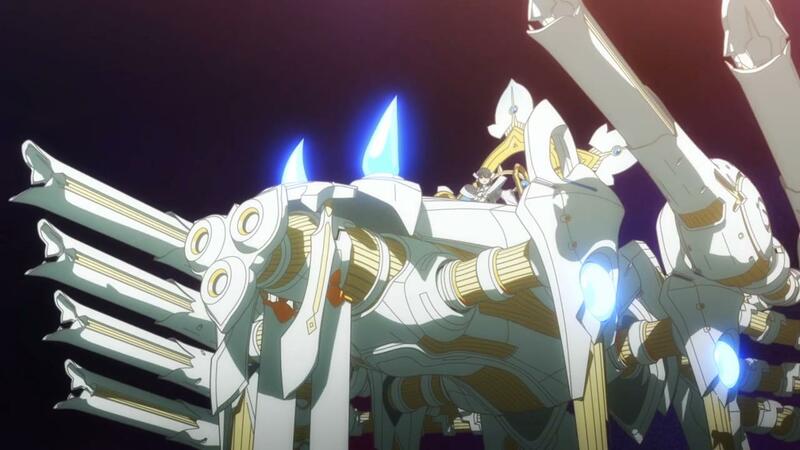 This realization sends Fu into a psychotic rage causing her to transform in public and go on a rampage straight to the Taisha, but the Taisha send Karin to intercept her saying she has become unstable causing them to fight publicly brandishing their weapons. Karin is last to know what is going on and once she finds out she has no answer to give Fu, but luckily Yuna and Itsuki get there just in time to save Karin and calm Fu down. As this is going on Mimori is on a mission on her own; she visits Sonoko one more time to hear the absolute truth about everything, including what happened with her. Armed with this new information that the world is basically gone, that it’s all an illusion and that the 7 Vertexes that they defeated are coming back again and will continue to come back. You remember that Togo has a 2yr gap in her memories and it all starts to come full circle. Mimori had already been a hero who went Mankai and lost her memory and the use of her legs as part of her sacrifice. The ribbon which she keeps at all times belongs to Sonoko who was her former teammate. It is also revealed that their fairy partners are not there to support them in battle, they are in fact acting on their own to keep each of the girls alive for as long as possible. So even if they try to commit suicide, which Mimori has tried to do, they will and can do everything to save them. So no matter what they will always be able to do battle. Togo goes past the barrier to confirm everything and what she sees horrifies her to the brink of insanity. There were millions of Vertexes swarming the area beyond the barrier and in the middle of all this the defeated Vertexes were being rebuilt and almost on the verge of coming back. 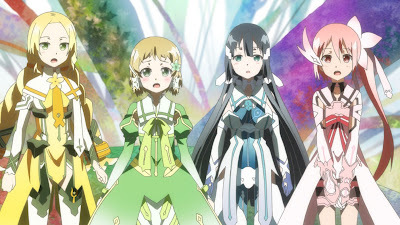 So Mimori decides that in order for them to find peace is to destroy this world and breaks the barrier that kept the Vertexes from pouring into the dimensional forest causing a true final battle to take place. Now the girls not only having to defeat the never-ending influx of Vertexes, but also have to try to stop their friend from destroying this world. With Fu an emotionally wreck and unable to fight, it just leaves Itsuki, Yuna, and Karin to save the day or at least survive it. Yuna is unable to transform because of Mimori’s words ringing in her head causing her to feel conflicted on what she should do. It is in this moment that Karin finally achieves Mankai form and promises Yuna to defeat all the Vertexes and find Mimori to bring her back home. As Karin slices her way through The vertex she recites the clubs 5 commandments while going Mankai four times during the battle; in the process she loses the use of her right arm, right leg, her hearing and vision. Yuna finally finding her resolve once more goes right after Mimori and in a scene that is straight out of Gurren Lagaan, punches Mimori straight in the jaw in a “let me see you grit those teeth!” moment. All 5 girls now working together give it one last push going Bankai one more time to defeat the threat. Their final push and Mimori's actions have an unprecedented effect on them and the world around them; Yuna can taste food again, Fu regains sight in her eye, and Itsuki can finally talk again. Mimori can walk again and has her full memory restored, and in a great turn of events the Taisha email the girls one last time letting them know that they are no longer needed. The most ominus thing was in the end credits of the last episode where Sonoko can be seen being able to stand and looking out to the ocean. In their first meeting Sonoko told them that should they not perform their duties she would be dispatched to take care of them. Another thing that is of note is that Karin's powers were hand me downs from the previous Hero Gin Minowa who was part of the original group that Sonoko & Togo were a part of. I was both enjoyed and was thoroughly intrigued by this anime. I like the concept of becoming a hero having consequences. It's almost the same type of thinking in American comic books which is why superheroes wear masks in order to protect those around them from their enemies. I felt it was more tragic than Madoka, because the girls were in danger of losing body parts without having to actually be hurt in battle. I do like that the tone didn't go dark, it still stayed bright and hopeful. Once that episode 5 hit I figured either the big boss was going to make an appearance or this anime was going into that really dark place. 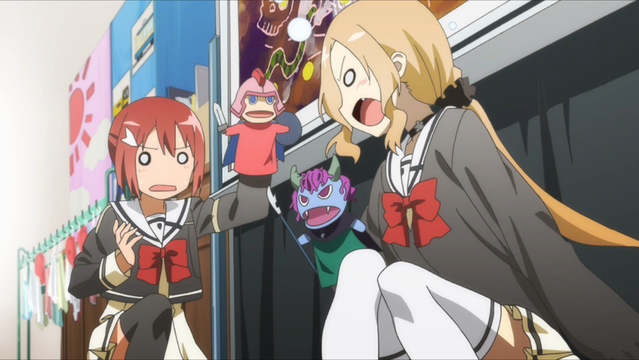 The fact that this anime was a combination of slice of life and action adventure. Seeing how the battles affected the girls personal life really kept me invested in it. Overall I give it 4 out of 5 stars ****. Animation was fantastic, story was good but it definitely felt it could have gone a bit longer to really flesh out certain parts of the story, and the costume designs were the absolutely best part of this anime. I loved how the costumes felt like an expression of each character. The Mankai forms were definitely well done, but I definitely felt that since the story was sort of sped up for obvious reasons, we could have gotten more scenes with them. 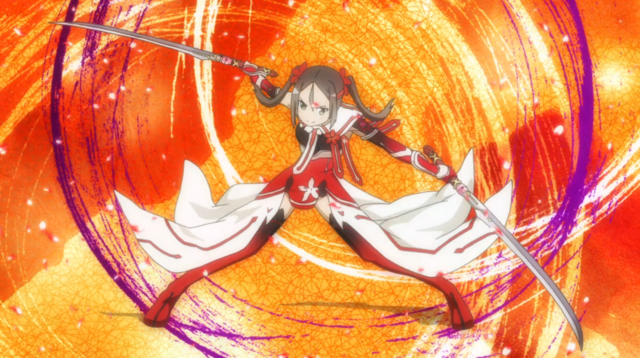 Quick note: Yuki Yuna Is a Hero Franchise teases a Project announcement in October. The official websites of visual novel developer Minato Soft and the Yuki Yuna Is a Hero anime both revealed on Saturday that MinatoSoft's "Minato Damashii" event celebrating the company's 10th anniversary will have two announcements related to the Yuki Yuna Is a Hero franchise during the event. 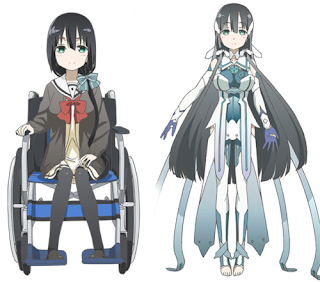 Haruka Terui, Juri Nagatsuma, Suzuko Mimori, Tomoyo Kurosawa, Yumi Uchiyama, and Kana Hanzawa, who all voiced characters in the anime, will attend the event, which will take place on October 23.